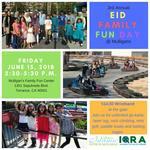 3 hours of Eid Fun for the kids!GoKarts, MIniGolf, Paddleboats, LaserTag, etc! Friday, June 15th 2:30-5:30 p.m.
*If you don't play, you don't pay. It's still a fun time mingling and spending time with the community.